For those looking to share a UK holiday with friends and family, it's well worth considering "Bedw Barn" in Newtown - just over the Welsh border. This large holiday cottage sleeps 14 people, and can be found on the owner's 72 acre farm. Next door to Bedw Barn you have a beauty salon, so should you fancy a little bit of pampering, this is the place to go. While the cottage itself has plenty to keep you going: you get your own heated indoor swimming pool, sauna and hot tub. The swimming pool is 7.3 metres x 3.5 metres, and is 1.2 metres deep - you can't beat an early morning dip to wake you up. Or how about an evening in the hot tub? located outside, on the verandah, the hot tub is a great place to lie and take in those wonderful surroundings. For an evening in during the colder months of the year, you have a wood burning stove. And there is wood pellet biomass central heating too - which helps give Bedw Barn some "green" credentials. A satellite TV, DVD player, CD player, iPod dock, washing machine, tumble dryer and dish washer are all included. There is Wi-Fi at Bedw Barn too. With your bed linen and towels also being included in the price of your holiday. 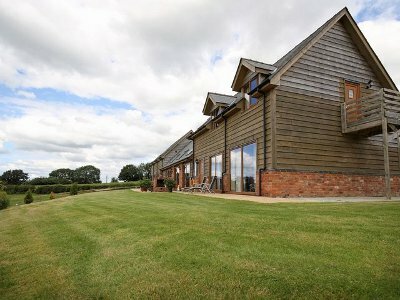 Bedw Barn sleeps 14 people in 7 bedrooms, with the bedrooms being made up of 4 double, 2 bunks, and a twin bedroom. There's plenty of places to walk during your holiday at Bedw Barn, and you get a lawned garden with patio furniture and a bar-be-que. With loads of parking too. Around the area you'll find the nearest pubs, shops and restaurant in Newtown - which is a couple of miles from Bedw Barn. The National Trust property of Powis Castle and Garden ("Medieval castle rising dramatically above the celebrated garden") is well worth a visit during your holiday. Or you could take a walk along Offa's Dyke - Knighton is a short drive from Bedw Barn, and makes a good place to start your walk along Offa's Dyke. Whether you want to abandon the car and enjoy the peace & quiet by your cottage; or you fancy exploring Shropshire and Wales - Bedw Barn makes a lovely place to take a holiday. Should Bedw Barn not be to your liking, but you fancy staying in the area around Newtown, you might well be interested in the cottages below. All these cottages are within a few miles of Bedw Barn.